Transport to and from accommodation included. Book now! Capacity is limited to 7 seats this summer. You will have a window seat with unimpaired views as you fly to Milford Sound through a landscape of unbelievable grandeur and beauty. 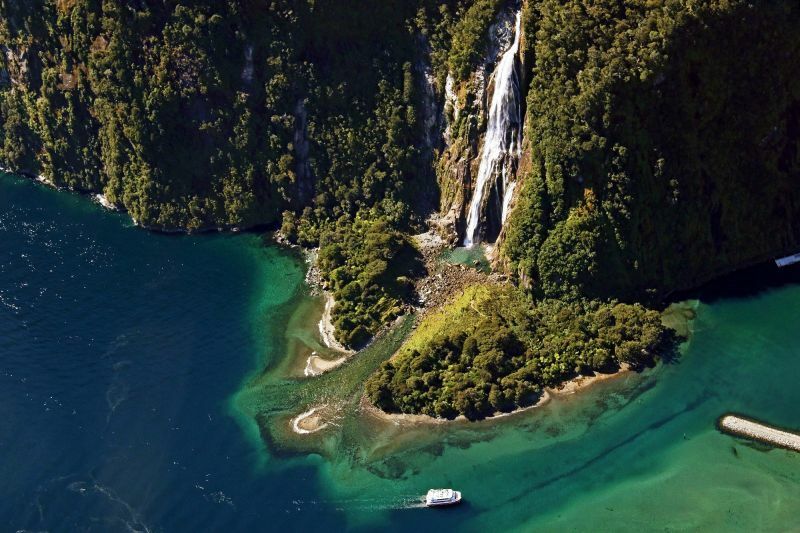 Once in Milford Sound, your pilot will accompany you from the airport to the boat terminal. Everything is organised for you, you don't have to worry about a thing. The cruise departs from Milford Sound boat terminal, travels out to the mouth of the sound for 1 hour 45mins and then to a Southern Discoveries wharf where the kayakers will disembark the cruise and start the Kayaking portion (1 Hour paddle time) of the trip. Tour includes entry to Milford Sound Discovery Centre and the Underwater Observatory. After your cruise and kayak, your pilot will be waiting for you at the boat terminal to accompany you back to the airport for your return scenic flight to Queenstown. Unlike many other Queenstown operators, on all our Milford Sound flights our route takes us via the glaciers of the Darren Mountains and Barrier Range.